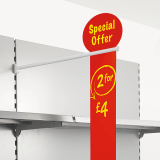 Use an Upright Aisle Fin Holder to showcase graphics and aisle signs including offers and promotions to your customers. This telescopic arm is stylish yet functional and features a pole which extends between 69-91cm. It has a single slot for drop graphics, if you wish to be able to present a header too, please look at product AFS7 which features a double slot. What is the diameter of the telescopic arm? The telescopic tube with hand adjustment has a 16mm diameter. What colours is the Aisle Fin Holder available in? The telescopic arm is available in either white or silver to suit your surroundings.